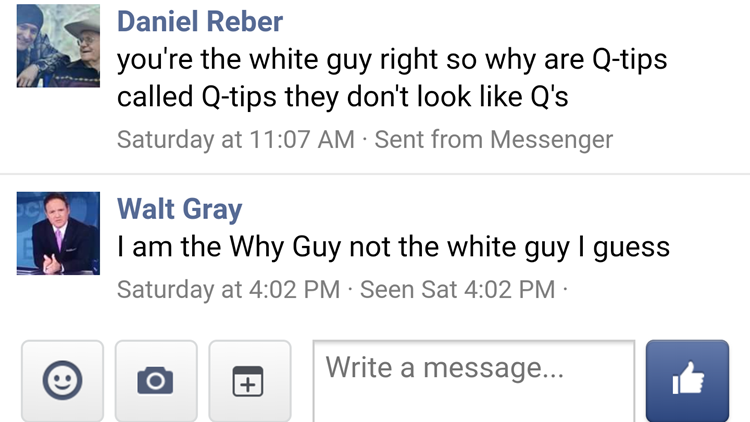 Today's Why Guy viewer question comes from Daniel Reber. Walt Gray's latest Why Guy question. White guy, really? Is it that obvious? Okay, I'll answer this WHY GUY question. The only thing I'm told about Q-tips is not to jam them all the way up your ear to your brain. But here's your official answer: According to the company, Q-tips is the name, because the "Q" stands for Quality. Q-tips started in the 1920's when the founder noticed his wife applying wads of cotton to toothpicks. The original name for the cotton stick was "Baby Gays," but switched to Q-tips in 1926. So that's my quick answer to the question about the quest to solve the Q-tip quandary. Also, bonus info, there's a rapper named Q-Tip who's pretty well known in my vast hip-hop circles, so there's that.